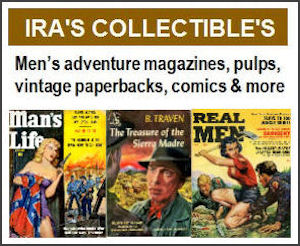 In my previous post here, I featured some of the original artwork by Earl Norem that’s owned by members of our Men’s Adventure Magazines Facebook Group. We’ve been posting a lot about Earl in the group since his death on June 19, 2015 at age 91. 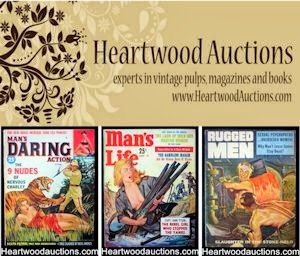 He was one of the greatest and most prolific of many great artists who worked for men’s adventure magazines and the related realm of comics. 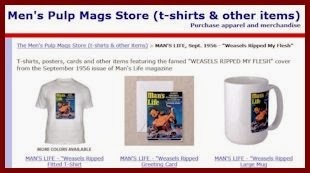 In a comment on a post in the group, one of the members who had not yet bought our first two men’s adventure magazine story anthologies – WEASELS RIPPED MY FLESH! and HE-MEN, BAG MEN & NYMPHOS – asked me if there are any illustrations by Earl Norem in those books. The answer is: Oh, hell yeah! There are some great Norems in those books. For example, the WEASELS anthology includes the masterful duotone montage illustration Earl Norem created for the “Book Bonus” version of Mario Puzo’s novel THE GODFATHER that appeared in the August 1969 issue of MALE magazine. Among the scenes included in the montage is at least one you will undoubtedly recognize: the bloody horse head in the bed. It and the other two small scenes are all worthy of a closer look. MALE’s “Book Bonus” excerpts from THE GODFATHER came out just five months after the novel was originally published by G. P. Putnam's Sons.The first edition of the book was released on March 10, 1969, with the iconic marionette image created by graphic designer S. Neil Fujita. If you’re a fan of this blog or our anthologies of men’s adventure magazine stories, you probably know that Mario Puzo wrote THE GODFATHER in his spare time while he was working as a writer and Associate Editor for Martin Goodman’s company Magazine Management. 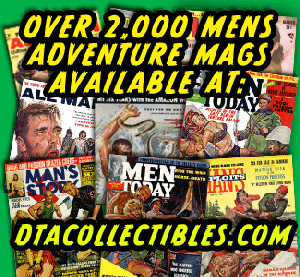 Magazine Management was the umbrella for various subsidiaries that published MALE and the other classic “Atlas/Diamond” men’s adventure magazines, such as ACTION FOR MEN, FOR MEN ONLY, MAN’S WORLD, MEN and STAG, as well as many other types of magazines, comic books (including the early Marvel Comics) and paperback books. In fact, Puzo wrote scores of stories for those magazines before Francis Ford Coppola’s 1972 movie version of THE GODFATHER launched his career into the stratosphere. 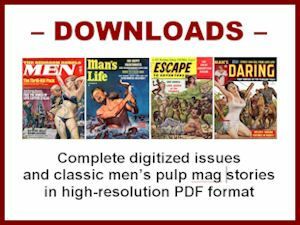 Most of Puzo’s men’s adventure magazine stories were written under the pseudonym Mario Cleri, but many were published under his own name. Giving Magazine Management the rights to publish a “Book Bonus” edition of THE GODFATHER was a nice nod to Puzo’s writing roots and MALE gave it special treatment. The front cover featured a terrific cover painting for the story by artist Mort Kunstler. It’s also a montage style painting featuring several scenes. To further enhance the cachet of their GODFATHER “Book Bonus issue, the editors had a special promotional “card” on fairly thin white paper glued to the cover along the left edge. The promo overlay has short quotes from reviews of the novel by the CHICAGO SUN-TIMES, NEWSWEEK, THE ATLANTA JOURNAL, THE NEW YORK TIMES and (for some odd reason) THE ANNISTON, ALA. STAR. To see the complete cover of the issue, you had to lift the overlay and fold it over like a flap or – as most readers appear to have done – tear it off. Underneath the review sticker is a headline for an interesting anti-animal experiment exposé titled “LET’S STOP THOSE ‘EXPERIMENT’ LABS THAT TORTURE ANIMALS” and another for a the story “THE TEROPOR TREK THROUGH THE EVERGLADES.” Today, it’s a valuable find if you can snag a copy of MALE, August 1969 with the GODFATHER review quotes foldover still attached. Inside the magazine, in addition to the main 2-page interior illustration by Earl Norem, there’s a second smaller, half-page Norem illustration for THE GODFATHER that we also reproduced in our WEASELS anthology. It’s Norem’s depiction of the classic scene in which Michael Corleone meets drug dealer Virgil “The Turk” Sollozzo (who had recently had his men try to assassinate Michael’s father Vito) at a restaurant, supposedly to discuss peace terms. Sollozzo is accompanied by the corrupt local police captain Mark McCluskey. In the novel, after the three men sit down at the table and have some initial discussion, Michael excuses himself and goes to the bathroom, where he retrieves a handgun one of the Corleone men had hidden for him before the meeting. When Michael returns to the table, he shoots and kills both Sollozzo and McCluskey, then calmly walks out of the restaurant. I love Norem’s illustration of Michael shooting of Sollozzo and McCluskey. I also love the restaurant shooting sequence in Francis Ford Coppola’s movie version of THE GODFATHER. When Michael (played by actor Al Pacino) kills Sollozzo (Al Lettieri) and McCluskey (Sterling Hayden), it signals that he has finally embraced being a member of a Mafia family and given up his attempt to be a “normal” member of society. And, the bloody denouement of the scene, with Captain McCluskey grabbing futilely at the spurting bullet hole in his neck, just before Michael shoots him in the head, is indelibly memorable. Mort Kunstler’s montage cover painting for MALE, August 1969 also includes a depiction of several scenes from the book, including his version of the restaurant shooting scene, a nice example of a “Good Girl Art” babe, a bedroom scene (possibly depicting Michael Corleone’s with his second wife Kay, played by Diane Keaton in the movie), a nighttime shooting scene. "Michael thrust the table away from him with his left hand and his right hand shoved the gun almost against Sollozzo’s head...The bullet caught Sollozzo squarely between his eye and his ear...Michael pivoted to bring the gun to bear on McCluskey...It caught McCluskey in his thick bull-like throat and he started to choke loudly as if he had swallowed too large a bite of the veal. Then the air seemed to fill with a fine mist of sprayed blood as he coughed it out of his shattered lungs. Very coolly, very deliberately, Michael fired the next shot through the top of his white-haired skull." Coming up: more Earl Norem art from our WEASELS anthology, our HE-MEN, BAG MEN & NYMPHOS anthology, and a new collection we plan to publish in the fall of 2015.